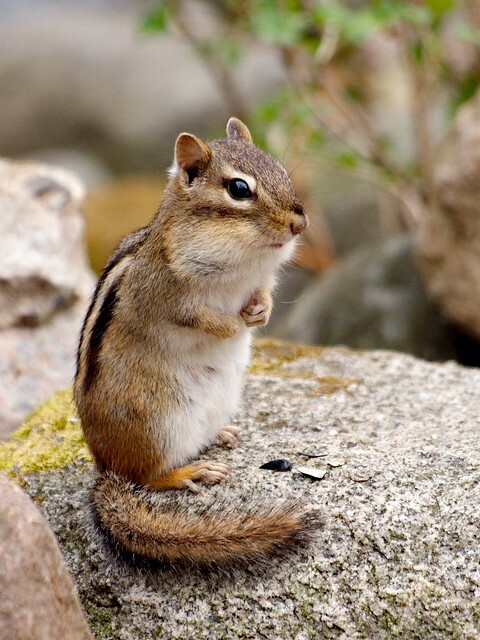 This Eastern Chipmunk was eating sunflower seeds near a birdfeeder at Elm Creek Park Reserve. Meanwhile, a big flock of White-Throated Sparrows have been eating sunflower seeds under our birdfeeder and kicking up leaf litter in the neighbor's yard. Interestingly, they are not doing their usual "Ohhhhh Saaaaaaam Peabody, Peabody" call that I'm used to hearing up north in their summer range -- it's more like "Peabody, Peabody, Peabody." Apparently they start out knowing only the surname of their target, and refine their search as they go. Those that cross the border switch to singing "O Canada Canada," presumably because they don't have jurisdiction.